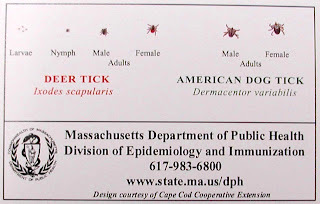 Can someone please inform as to the purpose of ticks? I understand that snakes, of which I am terrified, are good because they eat insects. I believe the same is true of bats. Worms, another thing that creeps me out, are good for the soil. But ticks? What purpose to those little bastards serve? I am asking because tick season seems to be in full swing here. Just about every day there is a tick or two on one of the dogs. The other day there was a dead tick in the bed. Near my pillow. I'm guessing it was from one of the dogs. As they say in Boston, that really skeeved me out. I have caught ticks crawling on me once or twice. None have embedded themselves in me (that I know of). And because they seem to go for the warmer parts of the body, when one does embed, I'm guessing it won't be fun to pull it out. I can just picture myself saying - "I don't recall ever having a freckle there before." What's that old saying, a tick in the hand is worth two in the bush? To me they are vile little creatures that should be eradicated from the face of the earth. Other than that, I have no strong feelings on the matter. Here's to hoping you have a tick-free day. Now you've "skeeved" me out. I hate hate ticks and I'm with you on everything. I've never had one on me, but pulled them off my dogs way too many times. Did you burn the tick sheets? Fortunately OC, the offending organism was on the dog blanket that covers the top of the bed. The thing was as flat as a pancake so I think it had expired from the dog's flea medicine. That is still a big ewww....I hate them...have you seen the ones that are flesh colored? They are absolutely horrid. Flesh colored? The only ones I have seen here are brown. Flesh colored would be even worse. Yuck. Maybe we don't have those here in Mass. I hope not. I'm feeling itchy all over now. THANKS! Regarding that joke - it has something to do with a piano, an organ, roses, and tulips. I think I first heard it years ago. Not really funny, just a little dirty. Yes...FLESH colored. I used to find them on my dog when we lived up in the Redwoods..can you say NAAAAASTY??? I did not need to read this post - Ewwww!!! I have no idea what I am going to do about Dudems if he ever has one on him - Can you hear me screaming EeeeaaaK! No worries Cristina - Call me and I will come running with my tick tweezers whether the tick (just had a bad typo here) is on Dude or on you. They are a preditor and a paracite. I am sure there is some creature that eats them...thus the purpose! skeeved huh? love learning new words. ticks; yuck. I'm skeeved and I'm itchy and now I am looking for flesh colored ticks. Flesh colored? Ewwwww! Just the thought of one of those little blood suckers diving head first into my warm body and pumping themselves up with MY blood..... YUCK! Ok, maybe I should do a post about something a littler nicer like kittens.